Recapping Season 6, Episode 7 of Pretty Little Liars. Aria realizes that she’s turning into Mona, and commences mutilating dolls, Hanna gets a suspicious scholarship and is hesitant to deposit it in the Bank of Lasagna, Emily goes full clinger with Sara, and even Shower Harvey is like, “Maybe a little too much, Em,” and Spencer learns surgery from youtube and accidentally lets Toby get high AF from her special gummy bears. Oh, and their latest plan to trap Charles is ruined by stoned Toby, because of course. Recapping Season 6, Episode 5 of Pretty Little Liars. 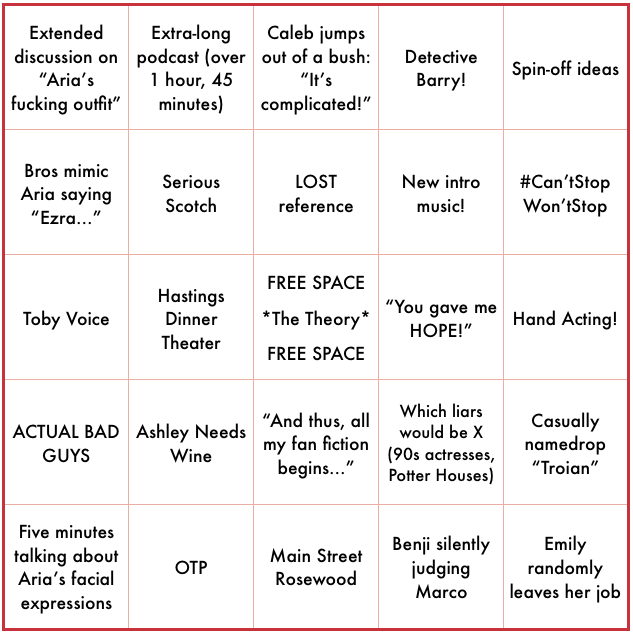 Aria goes to a creepy junkyard with Clark to take photos, and they might have snapped one of A, Hanna tries to help Mona patch up her relationship with a furious Lesli Stone, Emily a officially adopts Sara Harvey after getting her emancipated, then they get tattoos together, and Spencer is high on pot cookies and horny af with Toby out of town. Behold! The top minds in PLL criticism, Heather Hogan and Jacob Clifton, have joined us for a special roundtable discussion before the Pretty Little Liars Christmas Special. We’re answering questions from listeners and readers on twitter, such as "Which character is the most underutilized,” “Is Ali actually a sociopath,” and “Noel Kahn.” Thanks so much to Heather and Jacob for joining us, this was a ton of fun and we hope you all enjoy it too. You can find more from Heather on autostraddle.com, and check out Jacob’s TV writing on morningafter.gawker.com.